Das Buch war genial, bombastisch und grandios. Und gleichzeitig das unzufriedenste Bucherlebnis seid langem. Das Buch war genial, aber ich glaube gut finde ich es nur wenn es einen weiteren teil gibt. Mit Ende. Gnaaaaaaaaaaaaaaaaaaah! >.< Ich will weiterlesen. Ich will ein Ende. Ich will wissen wie es ausgeht und was hinter den Entitäten steckt und … nom nom nom. 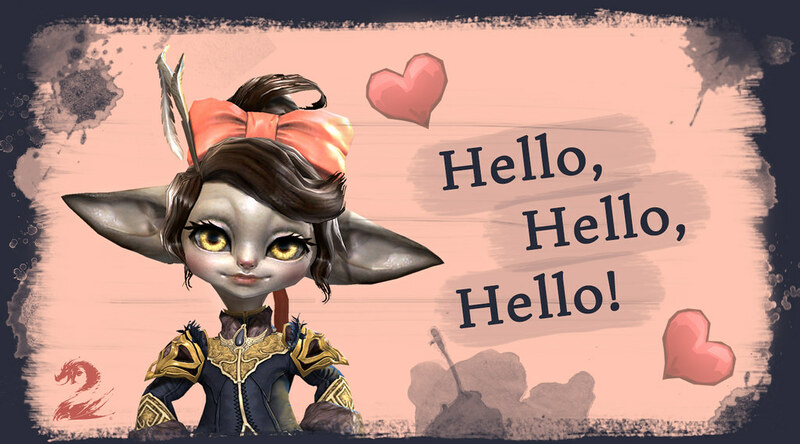 Good Morning Dear Developers and Guild Wars Players out there. I don’t know if I am alone out there with the Problems i see in the Short and Long Run with the Mega Server System, But i would like to state them, and maybe someone got a good answer for the Problems some of us, maybe many, will face. Or Maybe someone hears and finds a solution to them. So, for a start, i dont find the idea, in its core, bad to merge server in the pve area. But there are a few Problems that concern me very much. I lead, now since the very beginning, an in my eyes succesful all around guild. We do PvE and WvW, but it is important for us to do it together. Normally we would search for rather new players or players we really like to play with, and begin doing things together. We show them the world, the WvW Area, help them doing world events and other stuff. But now, if we, for example , find someone we really like, chances are they dont are on our server, what means, that we cant play evrywhere together. Or just in about half the stuff we do. Thats bad. 😦 And since not at least the cities are home server bound, i see no real chance in getting pve & wvw players for our server outside of wvw anymore. So no finding new players and showing them the world at the very beginning of their experience, which was very important for us. Helping them and protecting them on their way through Tyria. 😦 No Idea how to solve that, maybe making cities bound to your home servers. Our guild is rooted deeply in our server community, a fact i have enjoyed very much until now. I know many of the guilds, and most of the active Players, and i like reading the same names in the map chat. I mean, i dont care about the people i dont know, but now the people are scattered through many zones, and there are, as of now, not even the gendarran map to talk to people you know and like. They said in the beginning the zones will be sorted mostly weighted on your home server and your guild, or so i thought, wich would be awesome but it doesnt work. 😦 If you could fix that, it would be totally awesome. I Love my server, and the people, and the community, and me and many other people put work in getting the people there together, conquering world bosses, getting wvw running. I like playing in English. I Like Playing in german. I Like Playing in French. My client changes its language as i see fit since i can understand the languages good enough. But since the chat option to make people of other client languages out is activated automatically, it really calls for problems. And i dont really know why you did this, i mean, guild wars 2 has an awesome diverse community, and now you are blocking people out by default just because they like the sound of a character in a different language than their peers on the home server. I chose a german server, and speak german in map chat, guild and whisper all the time, so i dont see why my changing client languages should make me invisibly, by Default (! o.o ) to my peers on my beloved server. And the option was put in the game so quietly most people dont even know it exists, or that they could not even see map answers of guild colleagues for example. (We tried, didnt work :_:) or from the other people on the home server. I know many People wo speak german in the map chat but play in english because of awesome voice actors. Why discriminate diversity? 😦 And especially by default? )f you just sort for home servers instead, people still talk in the language they really choose for the home server. Another important Point, i think, that really bothers me: Through WvW and Harder World Bosses (Tequatl, worm, harder tempel events etc), The server Communities got actively encouraged to act together, and form a core. We got a Feeling of our server and are battling the other servers actively for over 600 Days now, in my case far over 3000 hours of gameplay, not counting the discussions in Teamspeak or extern platforms about the gaming community. And now you are putting people, wo are actively plotting against each other in case of wvw for the sake of their home server, in the same map. I dont see how this is going to work, i mean, either you really destroy the communitys that were necessary, especially for the smaller servers, to get something going, or you are really begging for war in the map chats because you put server communitys together that really don’t like each other. Dont know if you know the Game, but as i see it, it works as fine as if you would put Asmodeons and Elyos in Aion suddenly on the same side and expect them to work together. I really liked that now there are challenges and People have to think and work together first before the world events could get going. You got people together, and the communities that formed were really great, now it is scattered. The just called server communities are trying to get tequatl and other stuff running, even though there is the megaserver system. But now you put all problems together. if you try to get the people on the server to the event, they will be scattered through the zones, unable to play or help their guild and server mates. And, as i see it, there is probably no way of helping the unlucky ones who get in another zone where it didnt work. And if you try to organize the events, there is no way of getting all the people who really want to help each other getting into one zone and getting a piece of the cake at the end as thanks for the hard work. I know, the point plays into the same thing i said before, but i think it is worth talking about anyway. And at last, the new System really destroys the chances of playing for everyone who isn’t lucky enough to have a internet connection that is good for gaming. Guild Wars, for me, is about Community and Playing together, and i fear, if these problems continue, these things will be replaced with a, though full and inhabited, totally anonymous world where the Game alone must replace in the long run, what was lost by having fun with your friends. I know many People, me included, who played this long because people and game harmonize together, and you could have a long, stable game AND Community, which could still be fun in many years, until we all go to gw3 someday. Thanks for reading to all who got it this far, i know it was a really long text, and my english is not the most perfect. I hope it helps, and would be very glad about feedback. Heute werde ich ein neues kleines, hoffentlich erfolgreicheres Projekt als meine letzten Beginnen: Briefe über die Magie der Betriebswirtschaftslehre. Warum auch nicht? Sie ist ein gutes Vorbild des Guten Schülers und Studenten. ich habe heute gelernt was quasilineare Nutzenfunktionen sind 😀 (und die Welt ergibt plötzlich so viel mehr sinn!) Quasilineare Nutzenfunktionen bestehen zu einem teil aus einer variablen und einer Funktion. Die variable an sich ist normalerweise linear, die funktion nicht unbedingt. Daher Quasi zur hälfte eine lineare Nutzenfunktion.